27 April 2015, at 8:30a.m. INDONESIA - Hy-Line International recognised its 15-year partnership with C.V. Missouri of Indonesia while at the VIV Asia trade show in Bangkok, Thailand. 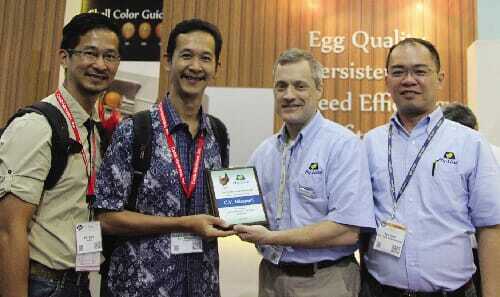 Jonathan Cade, president of Hy-Line International, commented: “With C.V Missouri’s long-time commitment to offering high-quality brown egg day-old chicks to the Indonesian market, we are pleased to be their partner. “We look forward to continuing this relationship long into the future,” he added. C.V. Missouri, located in Bandung, Indonesia, is a long-time day-old chick distribution company operated by the Latif family. C.V. Missouri is one of the principle hatcheries in the country, and one of the few with grandparent stock. Pictured left to right: Charley Latif and Edward Dharmaputra with C.V. Missouri; Thomas Dixon, international sales and marketing director for Hy-Line International; Ron Gooi, regional business manager in Southeast Asia for Hy-Line International.